We’ve rounded up the best smartphones you can expect to see in 2017. With the next year’s iPhone set to mark the 10th-anniversary of Apple’s smartphone lineup, speculation is rife that the firm has something big in store. If these rumours are to be believed, Apple will skip the iPhone 7S and iPhone 7S Plus in favour of the iPhone 8, which analysts are claiming will be the most radically redesigned iPhone yet with its ‘all-glass’ design and OLED screen. 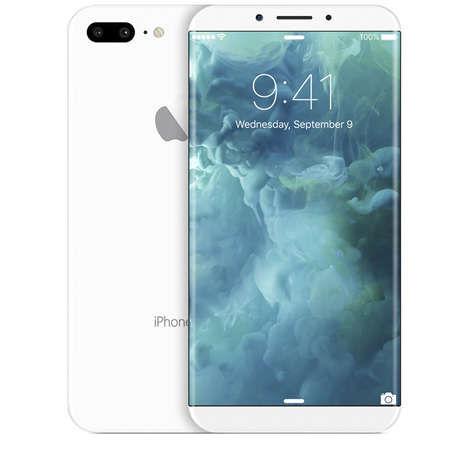 There’s also talk that the iPhone 8 will be the first to support wireless charging and a Touch ID sensor embedded in its display, while an all-new “Pro” model is rumoured to pack to feature an S7 Edge-style curved display and dual camera setup. Following in the footsteps of Apple’s iPhone, the Galaxy S8 will be the first smartphone to come with Samsung’s own artificial intelligence (AI) assistant built in. That won’t be its only similarity to the iPhone, as rumour has it that the Galaxy S8 will also dump the headphone jack, in favour of audio over USB-C.
Further speculation points to a 2K-resolution AMOLED Edge display, baked-in IP68 certification, both fingerprint and iris scanners, Qualcomm Snapdragon 835 power and a dual rear-facing camera setup. With this year’s Huawei P9 selling more than nine million units, it’s no surprise that Huawei is already planning a follow-up. While we don’t yet know much about the so-called Huawei P10, speculation suggests that it will be the first to feature an ultrasonic fingerprint scanner, which will be faster and more accurate than current capacitive sensors. Leaked specs also point to a 5.5in QHD display with a Samsung-style curved variant, Leica dual-lens rear cameras, Huawei’s own Kirin 960 chip and either 4GB or 6GB RAM. Given the fiery fiasco surrounding this year’s now-defunct Galaxy Note 7, one thing’s for sure about next year’s release: it (probably) won’t set on fire. Beyond that, we don’t yet know much about the so-called Galaxy Note 8, although we can expect it to come with support for Samsung’s S Pen stylus, a built-in iris scanner and a 5.7in display, with speculation pointing to a 4K resolution. Rumours also point to a Qualcomm Snapdragon 835 processor, and support for Google’s Daydream VR platform. Samsung Galaxy Note 8 likely will debut in August 2017.